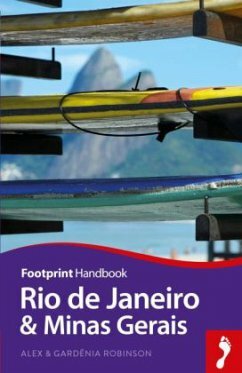 Describes points of interest, hotels, festivals, shopping, and restaurants in Rio de Janeiro and Minas Gerais, and provides practical information for tourists. Rio De Janeiro wie es ist. Gardenia Robinson, from Minas Gerais in Brazil, is a graduate of the University of Sao Paulo's prestigious Faculdade de Economia, Administração e Contabilidade. She worked as an investment banker in Brazil before moving to the UK to work on the first guidebook to the Amazon, inspired to write by her favourite author, João Guimarães Rosa. After travelling throughout Latin America, South East Asia and Australia (visiting more than 25 countries), she returned to Brazil to open and run her own NGO working with sustainable tourism in local communities. She has researched and photographed books on London, the Amazon, Brazil and Mexico for publishers including Cadogan, DK and Footprint and has had her pictures published widely in Brazil, Europe and the USA.